At Better Than Foods, they have a range of healthy and tasty pasta noodles and rice alternatives. 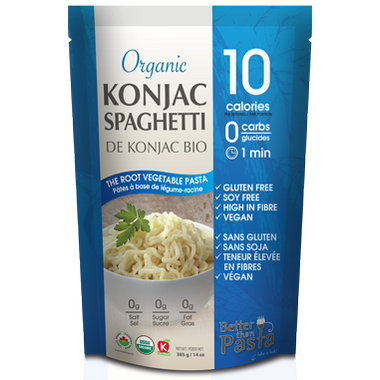 Their organic Konjac range is made from organic Konnyaku flour from the Konjac plant. Konjak is a low calorie, high fibre root vegetable that has been eaten in Japan for centuries. The package mentioned a small odour that you can rinse away. The odour was strong and never actually went away. The taste was pretty awful especially since the smell remained. I used homemade spaghetti sauce to cover the noodles and I could still taste the grossness of the noodles through all those spices. Had a few bites, threw out the rest. Also, the noodles do not digest well. Love these noodles! The taste and texture are very natural and the noodles are so low in calories! This product is easy to use and I truly enjoy the flavour and texture. I find this product very good and you can become creative, love the fact that is tasty for those days when you have low days carbs. Do not get fool by the smell once it wash and prepare is as tasty as good pasta! love this. I missed spaghetti so much. it is filling good tasting and easy to use, I can have it any time I want and as many times as I want.